Remove excess fuel by syphoning or by removing the fuel lines and draining the tanks. Inflate tyres to at least 15psi. Too much pressure with make the tyre contact points skittish, and lower pressure will help provide a larger “grip” footprint. Place the bikes across the container placing each bike in the opposite direction to the previous to prevent the handlebars clashing. Place a cheap 100mm thick foam mattress between each pair of motorcycles to prevent rubbing or more severe damage in the event that the ties let go for some reason. If you have no use for the mattresses on completion, regard them as a part of the removal cost and donate them to a pre-school or charity as long as they are in an unsoiled condition. 1880 x 910 x 100 covered foam mattresses cost $80 each approximately. Use the concave rib of the container to place the front wheel in. Have the front end hard against the container wall. This means normally that the rear end will be away from the opposite wall. 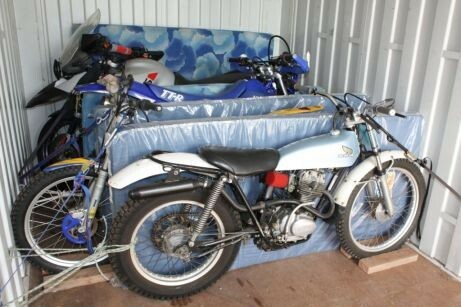 For the first bike in the container it is best to jamb the front wheel into the corner of the container and tie it down there, as one tie down point will be on the end wall and one on the side wall. This will cause the front end to twist sideways if you try to keep it straight, so don’t oppose the natural forces, go with them. Do not put bikes on their centre stands or side stands for extra support as this can be counter-productive and not allow the bike to be pulled down tight enough. Use good quality tie downs to pull down the front of the bike against the wall, and ensure that the tie downs angle away from the bike so that there is a triangulated effect holding the front of the bike. Cheap tie downs cost about $25 but can let you down when under load as the straps are usually a lesser quality fabric which does not grab as well (slippery feel) or the clips break under the pressure or are hard to undo. Spend a little extra and get good tie-downs. Give then to your mates after or keep them, you can never have enough! Use the lugs on the bottom of the container to support the tie down. You will need to use flat hooked tie downs to be able to fit them through the clearance between the container wall and the lug and loop them back onto the strapping. The hook should be positioned so that it traps the strap in so that it won’t slide out if the strap becomes loose for some reason. Use the free end of the strap to tie the strap off with a number of half hitches as security against the tie down clip releasing for some reason. For bikes with long travel front suspension, such as modern dirt bikes it is important to protect against compression of the front suspension with the subsequent rebound causing the hooks of the tie downs to slip out of the loop and let the front free. This is best done by pulling the suspension down onto a block of wood or an old oil container so that there is no or minimal compression of the suspension. The rear for the motorcycle needs to be tied back against the container wall using the same lugs on the opposite side. This can be done again with tie downs, but with light motorcycles rope is sufficient if well tied. Protect against chaffing of the rope by wrapping in cloth if it is a long journey. Again the idea is to triangulate the direction of the ties to prevent movement of the wheel sideways. For large heavy motorcycles tie downs should be used for the rear as well as the front, and attached to the frame rather than the wheel. One of the bigger problems with transporting motorcycles is not containing the front wheel from sideways movement, which if there is bouncing and compression of the suspension and the wheel unloads it can jump sideways and you have a bike on its side. This is easily controlled by mounting 100 x 50 x 400 timbers either side of the front wheel using self tapping wood screws into the container floor. These are easy to apply and on removal the screw hole is imperceptible. Two screws per timber. Rubbing and clashes of equipment may occur and need to be protected against. If tie downs are close to tanks or indicators etc then wrap and secure old rags around the likely rub point. Check also where bouncing due to suspension compression might cause rubbing and again wrap with rags. If levers or other handlebar equipment is likely to be close to another motorcycles, then loosen them off and turn them away from the likely clash point, or leave them slightly loose to allow movement. Foot pegs from dirt bikes can do nasty damage so whilst there may be a mattress in between, take care also to wrap them in rags or old gloves or rubber inner tube. After all that there is no guarantee that things will end up being perfect, as it is easy to overlook some critical aspect, particularly when judging the direction of likely reaction loads from movement. The best advice is to plan the tying down process, work carefully and double check all tie down points likely clash points and give the bike a good solid rock at the end to check that it is indeed solid and unlikely to move. People who have been around motorcycles for some time will have no problem with this process. Moving your car interstate? Check out our Interstate Car Transport page here.